Large haulers and delivery firms will be affected by the changes. FedEx began converting delivery trucks, pictured, to hybrid-electric systems in July 2009. WASHINGTON (Reuters) -- The Obama administration today proposed the first ever fuel efficiency and emissions standards for big tractor trailers and other commercial trucks. The joint Transportation Department and Environmental Protection Agency initiative covers a range of vehicles from delivery vans to long-haul rigs, and is expected to cut nearly 250 million tonnes of greenhouse gas emissions over the lifespans of vehicles produced within the program's first five years. The regulation, which would not be final until mid-2011, covers new trucks for model years 2014 to 2018. The standards, which are divided among three categories of vehicles, will save 500 million barrels of oil for vehicles manufactured during these model years. "It will reduce our reliance on oil. Strengthen our energy security and mitigate climate change," said Transportation Secretary Ray LaHood. "These new standards are another step in our work to develop a new generation of clean, fuel-efficient American vehicles that will improve our environment and strengthen our economy," added EPA head Lisa Jackson. 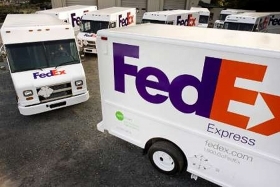 Firms that would be affected include UPS Inc., FedEx Corp., and Ryder System. Under the proposal, tractor trailer rigs will have to achieve up to a 20 percent reduction in carbon emissions and fuel consumption by the 2018 model year. Heavy-duty pickup trucks and vans, such as the Ford F-250 Super Duty and the Dodge Ram, will have separate gasoline and diesel standards beginning in the 2014 model year, with a target of an up to 10 percent reduction for gasoline vehicles and 15 percent cut for diesel vehicles by the 2018 model year. Vocational vehicles, such as concrete mixers, firetrucks, garbage trucks and buses, would need to reach up to a 10 percent reduction in fuel use and carbon emissions during the same period. Trucking companies say they support "technologically feasible" and predictable efficiency standards. The industry prefers that approach to any action that would raise prices in an effort to discourage diesel use and boost alternative fuels, the American Trucking Associations trade group said. EPA and the Transportation Department estimated that operators of semi-trucks could make up the cost of required technology upgrades in less than a year in fuel savings, and save as much as $74,000 over a truck's lifetime of use. Trucking is projected to haul about 14 billion tons of freight by 2018, compared with nearly 11 billion tons in 2006, industry figures show. Commercial trucks represent about 11 percent of all registered vehicles in the United States. The public will be able to comment on the agencies' proposals for 60 days. The Natural Resources Defense Council applauded the government's proposal as a step in the right direction, but said the standards should be tougher. "Heavy trucks and buses are the energy hogs of America's roadways -- but they don't have to be," said Luke Tonachel of the NRDC. "Today's proposal should be strengthened further to maximize the environmental, security and economic benefits." The Obama administration had ordered the EPA in late May to develop standards to lower emissions from heavy-duty vehicles, as the White House attempts to combat global warming. Estimates show that large tractor trailers, which emit about a fifth of the greenhouse gases from transportation, can cut emissions by up to 20 percent using existing technologies. The EPA and the Transportation Department finalized rules in April to reduce emissions from cars and light trucks. Those rules will require a 30 percent decrease in carbon emissions and a 42 percent increase in auto fuel efficiency to 35.5 miles per gallon (6.85 liters per 100 km) by 2016.